When it comes to venturing around the globe, many would be nervous of tackling the world's most exotic regions as a lone traveller – but Tony Giles takes a life of solo travelling in his stride, despite being blind. The 32-year-old, from Weston-super-Mare, has spent the past decade travelling to places such as America, South-East Asia, Africa, Australia and every corner of Europe, despite losing his sight at the age of 18, and also suffering substantial hearing loss. "I just love travelling," says Tony, who has published a travelogue, Seeing The World My Way. "People often ask why a blind person would want to travel the world when you can't see anything when you get there. It is a good question from a sighted-person's perspective, but travelling is about more than just seeing beautiful scenery, it is about engaging with a new place with all your senses – meeting the people, tasting the food – the sounds, the smells, the atmosphere – I can take it all in." Tony was diagnosed at a young age with cone dystrophy, a rare degenerative eye condition, and photophobia, an extreme sensitivity to light. He maintained some vision until the age of 18 when he lost all sight except for his ability to recognise bright sunlight. At the age of six, Tony also developed nerve sensory hearing loss that has progressively worsened over time. Despite this, Tony gained an American studies degree from Northampton University in 2001 and a masters degree in Transatlantic studies from Birmingham University in 2003. It was while studying the culture of the United States that he had his first real opportunity of solo travelling. "For part of my degree course I went over and studied in South Carolina," he says. "It was while I was there that I decided to take a trip by myself – to New Orleans. I had a fantastic time. I used to drink quite a lot – like many students – and I discovered that it didn't take me too long to make friends in the city's bars." Indeed, Tony pulls no punches in his book – confidently telling of near-the-knuckle experiences for any traveller, ranging from numerous drunken stupors, to an indulgent evening spent in a brothel while travelling through New Zealand. "I'm very honest about everything that's happened to me," he explains. "And I'm lucky enough to have a particularly good memory. "I don't keep a diary when I'm travelling, but I remember things so well, I don't need to. I think my memory is simply so well-exercised during the normal course of my daily life, it tends to work better than most people's memory. When you're blind, you rely entirely on memory to know where everything is in your house." Since leaving university, Tony has spent most of his time travelling abroad – living frugally, and surviving on a modest legacy left to him by his late father. "I love getting out there and meeting new people around the world – you're never alone for long," he says. "People are always fascinated by the way I travel alone, but for me it's the only way. I'm a very independent person. "When I was growing up I went to boarding schools where there were lots of disabled children who had far more debilitating conditions than me, so from a very early age I decided I wouldn't let my lack of sight and poor hearing stop me from doing things. "It's remarkably easy to find your way around, even when you're blind. You know when you've got to a tourist attraction, because you can hear all the tourists. "People are generally happy to speak English everywhere, and strangers have always been incredibly helpful." But if the solo travelling wasn't adventurous enough, while making his way through New Zealand in 2001, Tony had his first experience of bungee jumping. "I thought I should give it a try, and I loved it," he says. "I have the distinct advantage of not being able to see the ground. But it's still such an attack on the senses to feel yourself dropping down through the air. It is a great exercise in trusting people though," he adds. "Because I have to take their word for it that they have attached the rope. "But I was delighted that I did it. In fact, it was such a thrill, I've done more than a dozen jumps since." 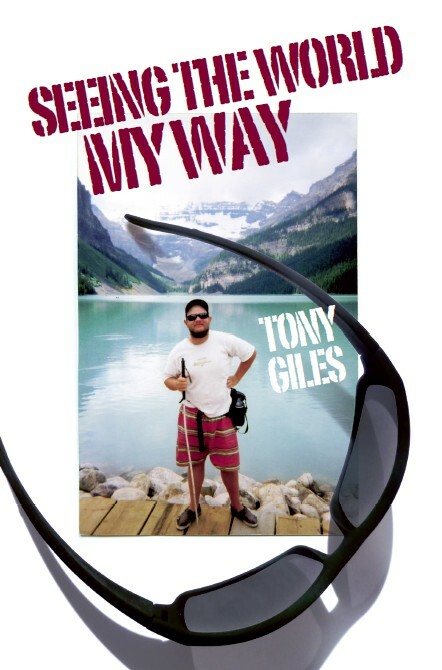 ■ Seeing The World My Way, by Tony Giles, is out now, published by Silverwood Books, priced £8.99. It is also currently being translated into Braille, and will be available through the RNIB next year. To keep up-to-date with Tony's world travels, follow his blog at www.tonythetraveller.com.